The city will open its new Koolau Driver's License Center at the Koolau Center, formerly known as Temple Valley Shopping Center, tomorrow at 9:30 a.m., a city news release said. 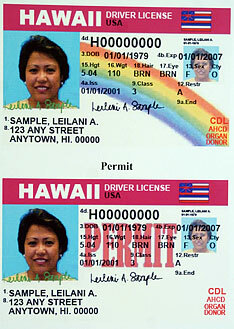 The opening marks the restoration of full driver's licensing services for Windward Oahu after a two-year hiatus. 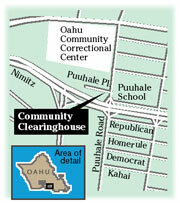 The city closed the Windward Oahu facility in 2004 for renovation of the Kaneohe Police Station. Officials did not resume licensing there because of safety issues, lack of parking and lack of staff. Pamela Yamagata, manager of Keoki's Paradise Bar in Poipu, Kauai, was commended by U.S. Sen. Daniel Akaka and Gov. Linda Lingle for her contributions to the community through the Training for Intervention Procedures Program. TIPS helps prevent intoxication, and helps decrease the risk of tragedies related to drunken driving and underage drinking. » Mission Houses Museum appointed David J. de la Torre as its next executive director. He has served as director of Art in Public Places and the Hawaii State Art Museum of the Hawaii State Foundation Culture and the Arts. » NAMI (National Alliance on Mental Illness) OAHU gave its Jean Butler Chapin Award to Dennis Mee-Lee, M.D., director of Hawaii Clinical Research Center for his support of people who have serious mental illness; to Helen Altonn, reporter for the Honolulu-Star Bulletin, for the education of the public; and to retired Rep. Dennis Arakaki for advocacy on behalf of the mentally ill.
You may also participate in the Adopt-A-Family program, in which businesses, employee groups, social clubs, families or individuals can help a specific family. Police officers who were watching a live video feed Monday night from a closed-circuit surveillance camera system in Chinatown saw a man punch a woman in the face, police said. Officers then caught the 34-year-old man as he tried to run away about 11:10 p.m. He was arrested for investigation of second-degree assault. The 36-year-old woman may have suffered a broken nose, police said. HILO » Big Island police have identified an apparent drowning victim Sunday as Jonathan Cupp, 45, of Hollywood, Calif.
Fire Department medics responding to a call at Kehena Beach 25 miles south of Hilo on Sunday afternoon learned that one apparent victim was all right, but in the meantime Cupp got into distress in the water, the Fire Department said. Medics treated him en route to Hilo Hospital, but he was pronounced dead there. The results of an autopsy were not immediately available. The Big Island fire department airlifted four missing hikers to safety Sunday. The hikers had apparently wandered off Captain's Trail while hiking near South Glenwood Road in upper Puna, officials said. The hikers guided the Hawaii County Fire Department, which received the call about 7 a.m., to their location using their cell phones, the fire department said. Ground rescue crews led the hikers to the landing zone. They were airlifted and later released after medical exams. Police arrested a 41-year-old Salt Lake man who allegedly tried to buy merchandise from a Pearl City business using a forged personal check and a fake passport as an ID. Police said the man tried to make the transaction about 6 p.m. Sunday. Store employees became suspicious and called police. The man was arrested for investigation of second-degree forgery, unauthorized possession of personal and confidential information, and third-degree theft.